I think most of us in Asia would take a banana for granted. Mainly because we are blessed with so many types and varieties in this part of the world. Furthermore it is about one of the cheapest fruit sold. In Malaysia and Singapore, bananas are eaten as it is, added to desserts, curries or stir fried. The bananas that are usually added to curries or stir fried would be unriped ones. I like using a particular type of banana in my cakes and desserts. Locally we call it "pisang emas" (translation to English means "golden banana"). It is grown in Malaysia and is exported out to neighbouring ocuntries. These bananas are short, fat and kinda stubby looking. When ripe, the fruit itself is amazingly sweet and gives out a wonderful flavour. It's extremely, extremely great over pancakes or waffles - just add some brown sugar, pinch of cinnamon and lightly brown the slices of bananas over a low heat. Yum and I'm wishing I'm having some right now. Sorry for the digression! 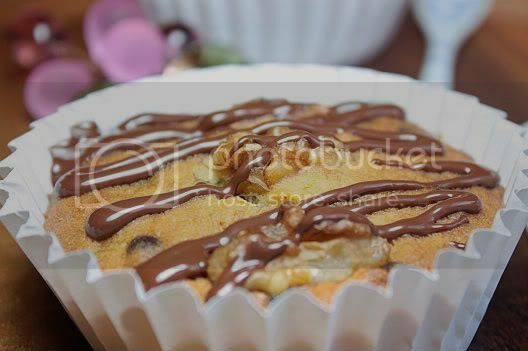 Anyway I've made bananas cakes, cupcakes and muffins before and some of the recipes have been posted in this blog. However I am always game to try out new recipes and this is another one to the addition. Again for this particular cake (which I downsized to "mini cakes") uses "pisang emas". You can use any other riped bananas you can get your hands on. By the way, if you have any left over riped bananas (and you are contemplating on throwing them out), mash them and store it in the freezer. They will keep until your next banana bread, cake or muffin recipe. I added a melted chocolate drizzle to the top as bananas go absolutely well with chocolate. 1) Cream butter and sugar until smooth and pale in colour. 2) Then add the egg and soda that which has been dissolved in the milk. Mix until incorporated. 3) Then add in the bananas and vanilla essence until it has mixed into the batter. 4) Shift the flour, baking powder and salt into a bowl. Add half of the dry ingredients into the batter and stir together. Add the remaining and mix until incorporated - do not overbeat your mixture. 5) Transfer the cake batter into a lined pan (or cupcake/cake liners) and bake in a preheated oven of 350F or 180C. 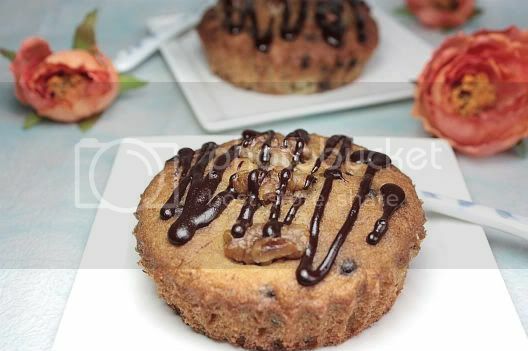 Top the batter with whole walnuts as decoration. For cake bake for about 30-40 minutes, for mini cakes it should take about 25 minutes and for cupcakes about 18 - 20 minutes. Bake until the skewer comes out clean. 6) Remove from oven and set aside to cool complete. 7) Melt (in 15 second bursts so as not to burn your chocolate) some bittersweet chocolate in a microwave and then drizzle it on top of your cooled cakes. Chocolate and banana - one of the best matches, ever! Absolutely divine cakes, Jo! As always! These little cakes are so adorable! I love that you write about the varieties and types of bananas. In the US we only get 1. What I wouldn't give....looks great! So cute and tasty - I love the chocolate drizzle on top. 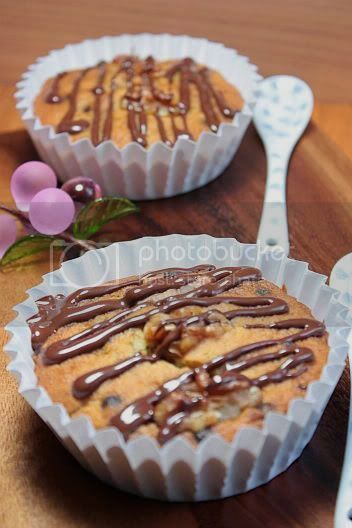 I do love the combo of banana and chocolate, these cakes sound absolutely heavenly! chocolate and banana.. yumm.. it looks really good! Yes I agree, I'm missing bananas at home though, the ones here are often lack of taste.